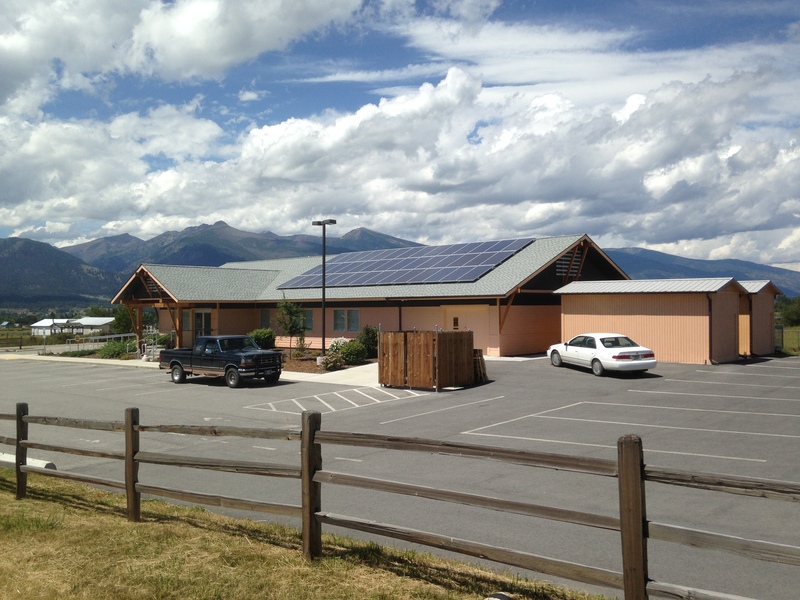 Pantry Partners recently installed a 12,600 watt photovoltaic system with assistance from NorthWestern Energy’s grant program. NorthWestern has three grant programs. One for personal homes, a grant for those with commercial service and one for non-profit organizations. The grants are limited each year, so after being turned down initially Pantry Partners reapplied and the system was installed in March 2015. This grid tied PV system provides a majority of the electrical usage which includes two walk in coolers and freezers. This good sized system generated approximately $300 worth of electricity in the month of July alone. Pantry Partners is a 501(c)3, volunteer organization that provides a once a month food box to those in need in North Ravalli County. In addition to the once a month food box, they also provide over 350 families with a Christmas food box to ensure clients are able to provide their families with a complete Holiday dinner. Pantry Partners also makes available Summer Lunch Program which provides extra food items for families with school-age children who receive free/reduced lunches at school and Birthday Boxes for client’s children up to 12 who have birthdays during the month. For more information on Montana Solar Electric Systems and the NorthWestern Energy grant program call Dan 406-381-5643. For more information about Pantry Partners http://pantrypartnersfoodbank.org/ or call (406) 777-0351.